Flywheel energy storage units, based on high speed units operating in a vacuum, has normally been used as bridging storage for standby plant, typically in server farms and other sites which require no-break standby energy. The technology has gone through the doldrums but has recently found new life as a grid-balancing storage unit for variable renewable energy plant. Flywheel energy storage systems (FESS) store electrical energy the form of kinetic energy. Early versions used massive flywheels attached to the rotors of generator sets, spinning at the same speed as the generator. In the case of loss of input power the flywheel supplied energy to the generator until the associated diesel engine started up. Modern flywheels are stand-alone units but use the same principle, i.e., the motion of a spinning mass, the rotor. The rotor spins in a nearly frictionless enclosure. When additional power is required, because grid power fluctuates or is lost, the flywheel’s inertia keeps the rotor spinning and the resulting kinetic energy is converted to electricity. 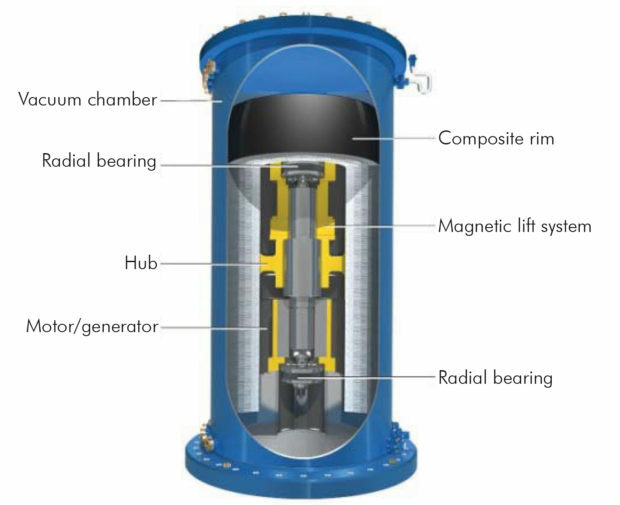 Most modern high-speed flywheel energy storage systems consist of a massive rotating cylinder (a rim attached to a shaft) that is supported by magnetically levitated bearings. Fig. 1: Flywheel storage in relation to other technologies . To maintain efficiency, the flywheel system is operated in a vacuum to reduce drag. The flywheel is connected to a motor-generator, which interacts with the utility grid through power electronics. Some of the key advantages of flywheel energy storage are low maintenance and long life. Some flywheels are capable of well over 100 000 full depth of discharge cycles and the newest configurations are capable of even more than that, greater than 175 000 full depth of discharge cycles. Flywheels also have negligible environmental impact and can bridge the gap between short-term ride-through power and long-term energy storage with excellent cyclic and load following characteristics . Initially used as bridging units in standby plant operation, FESSs are now finding application in grid stabilisation, especially where increasing amounts of variable renewable energy (RE) in the grid exist. FESSs respond more quickly to rapid changes in generation than conventional thermal generation sources, especially when such variations are of short duration. Grid code requirements in many countries compel operators to provide frequency compensation and load/generation balancing, and encourage this with attractive tariffs for such services. In addition, FESSs can also be used by operators of RE generators to keep the output to the grid stable. The technology has found some application in grid balancing, but has not been adopted to any great extent until recently. Correcting momentary imbalances in generation and load is critical to maintaining a stable power grid. However, achieving this balance in real-time has always been a challenging task due to the time it takes conventional power generators to ramp their power output up or down to support these constant load and generation system fluctuations. Flywheel storage systems have much faster ramp-rates than traditional generation and can correct imbalances sooner, with much greater accuracy and efficiency. Fig. 2: A 20 MW grid regulation unit . Flywheels can ramp to full power almost instantaneously. This fast response makes flywheels an ideal resource to provide regulation services thus freeing up thermal generators to service the energy market and operate at higher output levels, improving fuel efficiency and reducing emission rates. The steadier operation also reduces generator wear and tear, with associated system operation and maintenance costs. Constantly available frequency regulation resources are becoming more critical to maintaining grid reliability, especially as intermittent generation increases. FESSs fall in the short duration, medium power sector of electrical storage technology. Units can be combined to provide high power output but duration remains limited. Although the majority of units in service have relatively low capacity – typically in the range of tens of kW – larger units for utility scale usage are appearing or under development. Beacon Power has a standard unit capable of 160 kW, and are developing a unit of twice that capacity (320 kW). Some manufacturers have machines capable of 500 kW output, and a unit of 1 MW is reportedly under development . Larger units are constructed by combining individual units into a farm. Installations of 20 MW total capacity, consisting of 200 individual flywheel units, exist . Energy storage capacity is the amount of energy that a flywheel can deliver, and is dependent on the discharge rate. FESS units can deliver energy within a wide range, from full power to somewhere near 30% of full power. Fig. 3 shows a typical output curve. The FESS can provide short bursts at maximum power as well as longer duration bursts at lower power. Fig. 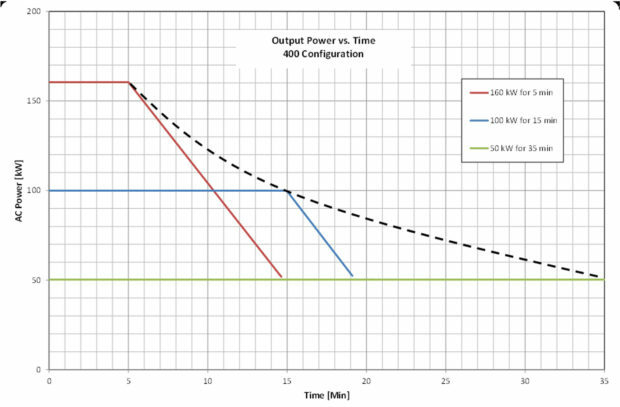 3: Output power vs. discharge time for Beacon Power’s 400 unit . Energy delivery for the unit shown at maximum power will be approximately 50% of the energy delivery at minimum output. Unit energy storage capacity is quoted as that at the minimum power output. FESSs are currently limited to a maximum duration of about 30 minutes at the lowest output power and around five to ten minutes at maximum power. One of the main advantages of FESS over other technologies is its cycling ability. Some manufacturers are claiming a cycle life of 500 000 cycles and claims of 170 000 or more are typical. This compares very favourably with the 12 000 or more cycles for batteries. For normal standby operation, cycle life is not so important, but when balancing a variable resource, a cycle frequency of several hundred per day can be experienced. Grid balancing cycles of 6000 per year are typical, although not all will be full discharge cycles . Most designs follow a similar construction style although there are a number of variations. Fig. 4 shows the construction of a typical FESS unit. The motor-generator consists of a stationary stator containing the drive coils, and a rotor integrated with the rotating rim or flywheel portion of the FESS. Permanent magnet and synchronous reluctance motors are typically used. The rotor rim is suspended using magnetic bearings, and the whole unit is sealed to provide operation in a vacuum. One variation uses a magnetic clutch to couple the motor to the flywheel drive, obviating the need to operate the motor in a vacuum . Fig. 4: Typical flywheel storage construction . High-speed flywheels use either solid steel or carbon composite rims. The choice of rim material will determine the system cost, weight, size, and performance. Composite rims are both lighter and stronger than steel, which means that they can achieve far higher rotational speeds. The amount of energy that can be stored in a flywheel is a function of the square of the rotational speed (RPM), making higher rotational speeds desirable. Steel rims are heavier than carbon composite and run at lower speeds. Typical rotation speeds run from 10 000 RPM for steel rims to 100 000 RPM for composite rims . For flywheels, doubling mass doubles energy capacity, but doubling rotational speed, quadruples energy capacity, thus giving carbon composite a significant competitive advantage. 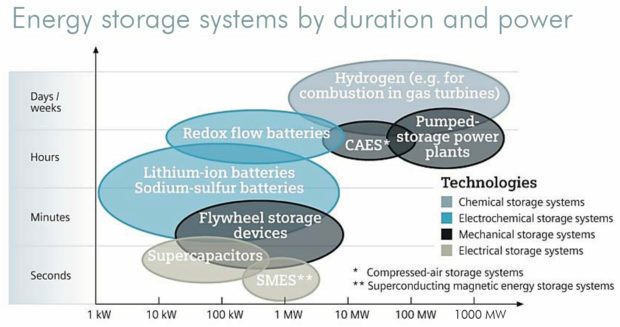 Flywheel energy storage systems offer excellent short-term performance and high cycling ability, but fall short when it comes to longer term storage. FESSs have been used in a hybrid configuration together with storage batteries in a project in Ireland . The Rhode hybrid demonstration project comprises two Beacon Power 160 kW flywheels and Hitachi Chemical valve regulated lead acid (VRLA) batteries of up to 240 kW. The plant will have a maximum import capacity of 400 kVA and maximum export capacity of 422 kVA when completed. The flywheel system, with very high cycling ability, can rapidly absorb short-term excess grid energy and generate energy as needed by grid operators. Batteries provide energy over longer periods but have lower cycling capabilities. The hybrid flywheel will assist in disruption mitigation, during times of unexpected or sudden changes in energy supply or demand. The cost of FESS is presently relatively high when compared with other storage technologies, but when lifecycle costs are considered the technology seems to have an advantage. Developments are expected to result in significant decreases in the price of these units in the future. Siemens: “Fears of power loss fade”, Pictures of the future, 9 March 2015. P Fairley: “Flywheels get their spin back with Beacon Power’s rebound”, IEEE Spectrum, 24 December 2014. P Fairley: “Flywheels keep the grid in tune”, IEEE spectrum, 27 June 2011. J Parnel: “Flywheel-battery hybrid system installed in Ireland”, Energy storage news, April 2016.